Bruce Gillespie, an associate professor in Digital Media and Journalism, has been named Wilfrid Laurier University’s 2017 Teaching Fellow. 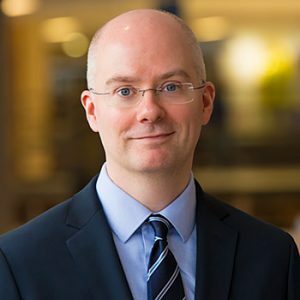 The Laurier Teaching Fellowship program recognizes and honours members of the Laurier faculty who exhibit an excellent record of achievement in regards to educational leadership while substantiating exceptional contributions to learning and teaching. Gillespie, who has been at Laurier since 2010, is also the first individual from Laurier’s Brantford campus to receive the Teaching Fellow. “It’s really exciting. I think that because a fellowship like this exists [it] says a lot about the priority that the university places on teaching and learning, which is quite big,” said Gillespie, award-winning writer, editor and journalist. The award is rather unique as it comes with a special fund attached to it, allocated towards helping the recipient carry out a research project that is related to teaching and learning. “My funding is going towards a project about how to get students in professional programs like journalism … more interested in theory than practice,” Gillespie said. His focus will be to use storytelling and various elements of game design to explore how students can be more engaged and make critical connections between practice and theory. “One of the challenges you run into in a program like journalism is students find it really exciting and engaging to learn the skills portion of the courses. It’s fun to learn how interview people and how to work with different tools and recording equipment,” Gillespie said. In contrast, Gillespie explained, students often find theory courses less interesting and engaging as the concepts may seem abstract. One goal of his research is to help students understand the theoretical concepts on the same level as their practical counterparts. “[You] really have to find this balance of teaching students the relevant skills they will need in the job market and in the world as graduates,” Gillespie said. Another focus of Gillespie’s within the classroom is to ensure his course material is updated as frequently as possible. This is especially important when teaching in a field such as journalism, where industry standards are rapidly changing and evolving. In order to do so, Gillespie frequently takes the time to figure out what kinds of new reporting are occurring, what kinds of reports audiences are expecting and what kinds of tools journalists are using in the present day. By collecting this information, Gillespie is better able to bring the necessary skills into the classroom. “It takes a lot of time to figure out what’s going on and to teach yourself the new stuff in order to teach students, I think that’s one thing that makes my classes different,” Gillespie said. Gillespie will be recognized as this year’s teaching fellow on May 26 at the Teaching Awards reception in the Hawk’s Nest.